Do you need to keep bushes, hedges or shrubs under control without back-breaking labor? If your garden isn’t huge, maybe a corded electric hedge trimmer is your best bet. Lighter & quieter than gas powered trimmers, cheaper & more powerful than their cordless equivalents, and much less tiring to use than traditional manual shears, electric hedge trimmers come in various sizes and capabilities. After many hours of in-depth research & discussion with gardening experts and home users, we believe the Black+Decker HT22 Hedge Trimmer is the best hedge trimmer for most situations. The workhorse of the available electric hedge trimmers, this has been our top pick since 2014. We can’t think of a reason to change this year. We have a new runner-up, the Toro 51490. 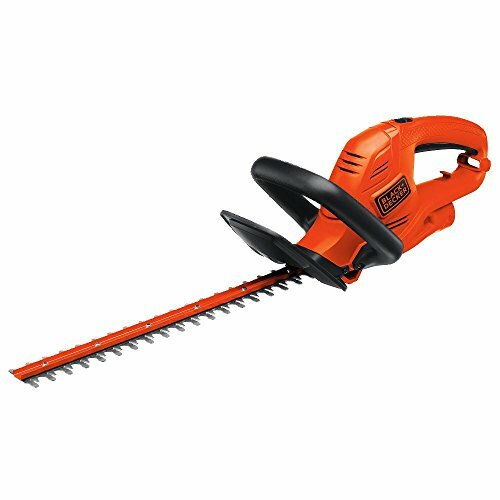 This 22” hedge trimmer has the same blade length & motor size as our first choice, but is usually a bit more expensive. The B﻿lack﻿+Decker HT18 remains our budget choice. Electric hedge trimmers have most of the same advantages as cordless trimmer﻿s. They are light-weight and quiet (significantly quieter than gas trimmers). There shouldn't be any expensive ongoing maintenance. Also, some electric trimmer models are more powerful than any cordless trimmer on the market. You don’t have to worry about storing, charging and replacing expensive Lithium-Ion batteries after a couple of years (or worse, having to replace a perfectly good trimmer because the manufacturer has changed the battery style and no longer supports your model!). Finally, they are the least expensive type of trimmer to buy. Electric hedge trimmers have most of the same advantages as cordless trimmer﻿s. They are light weight and quiet (significantly quieter than gas trimmers). An electric model is very easy to start, compared to a gas hedge trimmer – all you have to do is pull the trigger and you’re ready to start hedge trimming. The main downside of a corded hedge trimmer is the power cord. If you have a large garden, you may not be able to reach the farthest extents, even with a 150’ extension lead (150’ is normally the longest recommended extension lead). You should never use a longer power lead than recommended, or make up the length by connecting shorter leads together. Extension leads are designed to carry a certain amount of current (electrical power) over a certain distance. If you exceed the distance by connecting multiple leads together, the cable may carry more current than it’s designed for, which can cause overheating or even a fire. The power cord is a trip hazard, it may get tangled in your shrubbery, it could get accidentally unplugged, or you may even end up cutting it with the trimmer. 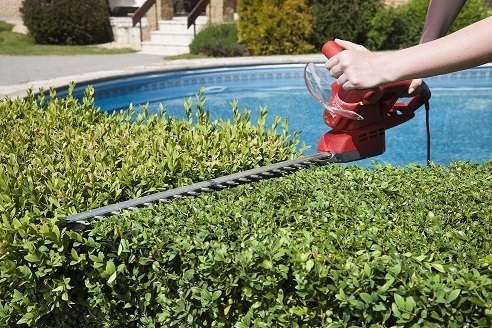 Despite this disadvantage, if you are trimming hedges and shrubs in an average-sized garden, you may find an electric hedge trimmer is perfect for your needs. How big are the thickest branches I will be cutting? Thicker branches will require both a larger tooth gap and a more powerful motor than smaller shrubs. How far from a power source is the farthest hedge? If you need to use the trimmer more than about 150' from the nearest outdoor power source, you may need to look at a cordless or gas-powered trimmer instead. Alternatively, if you currently only have e.g. a 25' extension cord and don't wish to buy a longer cord in addition to the hedge trimmer, you could consider an alternate trimmer type. How long will I be using the trimmer without a break? The weight of the trimmer, and how comfortable it is to hold and use, will become more important the longer you plan to use the trimmer uninterrupted. For more about how to select from the different types of hedge trimmers available, check out our hedge trimmer buying guide. Head over here for the latest cordless hedge trimmer reviews. Black+Decker make several electric hedge trimmers of a very similar design. The main variation between models is the blade length, though the smallest models are also slightly less powerful and are not capable of cutting through 3/4" stems. Currently you can buy these models in 16",17",18",20",22" and 24" blade lengths. In our opinion the 22" model is the sweet spot in the range - extremely light weight at 5.5lb, the most powerful corded hedge trimmer in the Black+Decker range, and very reasonably priced. We think if you don't have a huge yard, and aren't regularly cutting through old-growth branches, this hedge trimmer should be your default choice. The Black+Decker HT22 Hedge Trimmer has a powerful 4 Amp motor. 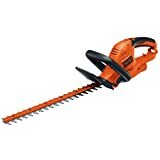 What this means in practice is, it has more than enough power for most domestic jobs, and is strong enough to cut through branches up to 3/4 inch thick (in fact the 22" model is more powerful than any other Black+Decker trimmer in this range, including the 24"). If you don't have a large amount of trimming to do, and / or you would like to trim your hedges or shrubs into intricate designs, you could consider a smaller model. A longer blade will cut through more vegetation with the same amount of movement and effort on your part. However, we feel the extra 2" offered by the largest models of this type doesn't offer a noticeable advantage in this regard. The larger 24" trimmer is noticeably heavier though, which can cause fatigue over long periods. The HT22 has a 22-inch dual-action blade - according to the manufacturer this reduces vibration by up to 40%, compared to traditional single-action blades, and cuts cleanly and quickly. Early hedge trimmers had 1 fixed blade and 1 moving blade. The moving blade cut against the static blade. With dual action blades, both the top & bottom blades move in opposite directions. This reduces vibration, as the movement of 1 blade 'cancels out' the movement of the other blade in the opposite direction. Less vibration is better for you (less fatigue), and your machine (longer life). The stainless steel blades should stay sharp for many seasons without maintenance. Its lightweight, compact design is easy to use and causes less user fatigue. This trimmer is easy to operate with 1 arm at full extension (although this is not recommended by the manufacturer - do so at your own risk!). The HT22 is ergonomically designed, to make it more comfortable & less tiring to use. It has a wrap-around front handle, which is comfortable to hold in all orientations. A soft-feel grip makes this trimmer comfortable to hold while trimming. The handle is large enough to accommodate gloves. Black & Decker back the HT22 with a 2 year warranty. Some users miss a feature of older electric hedge trimmers, where the safety switch, once engaged to allow the trimmer to start, stayed engaged. This made it easy to use the trimmer single-handed. Modern trimmers, including the HT22, require the safety switch and trigger to be held down. This is actually one of the safety features of the HT22, however it does make single-handed operation more difficult. One minor issue some users have noted with the Black+Decker trimmers is that the moving parts of the blade extend beyond the static part. If you're trimming hedges along a wall or chain link fence for example, the moving part of the blade can catch on the solid object, potentially causing damage to the blade or the object. The cutting capacity is slightly smaller than the HT22 (9/16 inch vs 3/4 inch). In our opinion the Toro's handles are slightly more comfortable to hold than the Black+Decker, however there's not much in it & it's very much down to the individual. 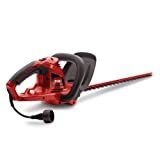 The Toro 51490 only misses out on 1st in this comparison because it is usually priced higher than the equivalent Black+Decker model – for most trimming jobs, either trimmer would be just as effective. As always, prices are subject to change, so if you find this trimmer on sale, you will not regret buying it. The B﻿lack﻿+Decker HT18 is a smaller, lower-priced, lightweight hedge trimmer. With an 18" blade, it would take significantly longer to cut a large area. Also, the motor is less powerful (3.5A), and the tooth gap is smaller (maximum 5/8") than the larger models in this comparison. Ultimately the HT18 would be less capable of cutting through large, tough shrubs. However, it still benefits from the dual-action blade and 2-year warranty of the larger models, and is even lighter than our top pick, at 4.7lb. If you really want to save a bit of money (and generally this trimmer is only a few dollars cheaper than an equivalent 22" or 24" model), the HT18 should give you years of dependable service, without too much maintenance. 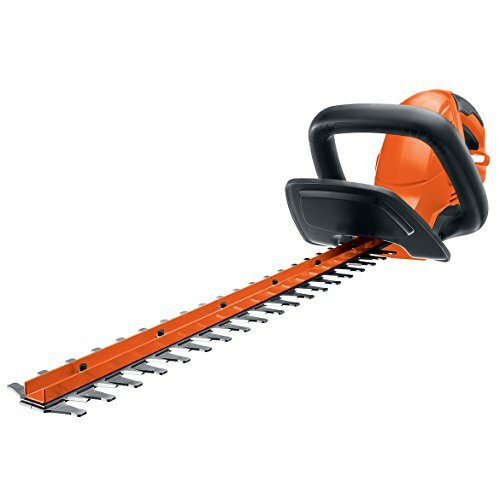 Alternatively, if you're specifically looking for a smaller trimmer to do more intricate, delicate trimming, in our opinion the Black+Decker HT18 is the best corded trimmer you can buy. 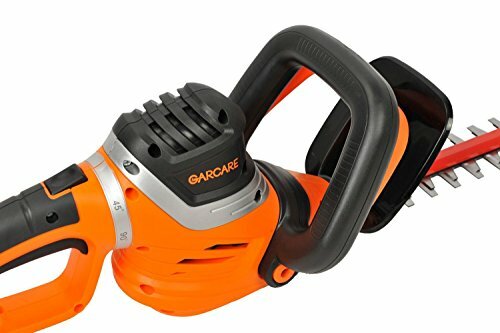 The GARCARE GTH08 is more powerful (at 4.8 Amps) than the models mentioned above. If you have a lot of particularly thick shrubs to cut through, the extra power may be a factor. Like the Black+Decker and Toro hedge trimmers, this model has a dual-action blade, safety switch and a 2 year warranty. The GARCARE model has a slightly larger 24" blade, however it is significantly heavier at a little over 8lb. One additional feature of the GTH08 is its rotating handle - you can rotate the rear handle through 180 degrees. However, the extra weight & higher cost are enough to put us off this model. Also, the manufacturer doesn't have as long a track record as some of the alternatives. The Remington RM5124TH is the most powerful corded hedge trimmer we could find on the market, with a 5 Amp motor. It's an absolute beast, and if there's any hedge or shrub you can't cut through with it like a knife through butter, you likely either need a commercial-grade gas trimmer, or a chainsaw. One issue with this trimmer is the design of the safety switch - several users didn't like the design of it, and in a couple of cases it failed completely. The WORX WG209 has very similar positives and negatives to our 1st and 2nd choices above (in fact it has a slightly longer 24" blade, while still keeping total weight below 6lb). However, we can't recommend this model as it's significantly more expensive than the proven Black+Decker and Toro models. On some occasions we've seen this trimmer advertised by the same vendor for almost 50% more than the Black+Decker HT22. 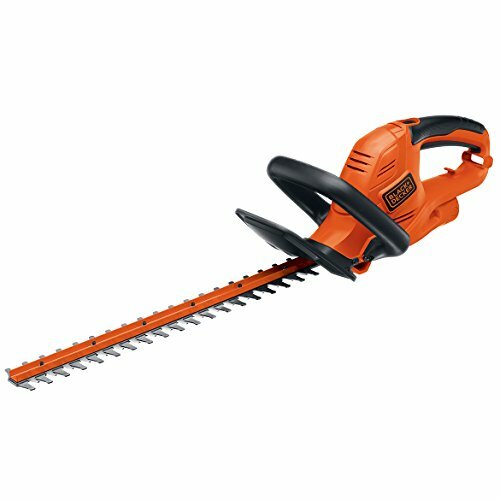 The Black+Decker HH2455 is a larger 24" hedge trimmer - confusingly it has a less powerful (3.3A) motor than our first choice. Like the GARCARE model, it offers a rotating rear handle (in this case the handle rotates up to 180 degrees, with 5 set positions in between. Unlike almost all the other electric trimmers on the market today, this model has a lock-on switch, allowing you to operate it without keeping the trigger engaged. While we believe you should take safety seriously, and this is clearly less safe than the system the other trimmers use, it is common for owners to complain about the lack of this feature on other hedge trimmers. 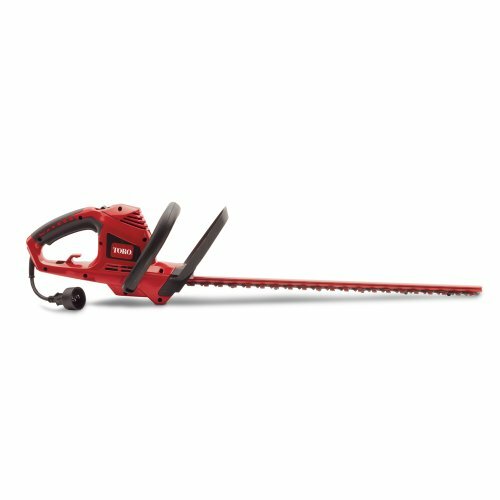 This hedge trimmer just misses out on being one of our main choices as it's usually more expensive than comparable models, it's less powerful than the alternatives, and it's also slightly heavier (6.5lb) than some of the more powerful models available. This guide has some useful information on maintaining your hedge trimmer. Most of the manufacturers have maintenance and care guides posted on the internet. Some of the guides go into more detail than others. Of the guides we have read, this one from Stihl and this from Remington cover all the important points. 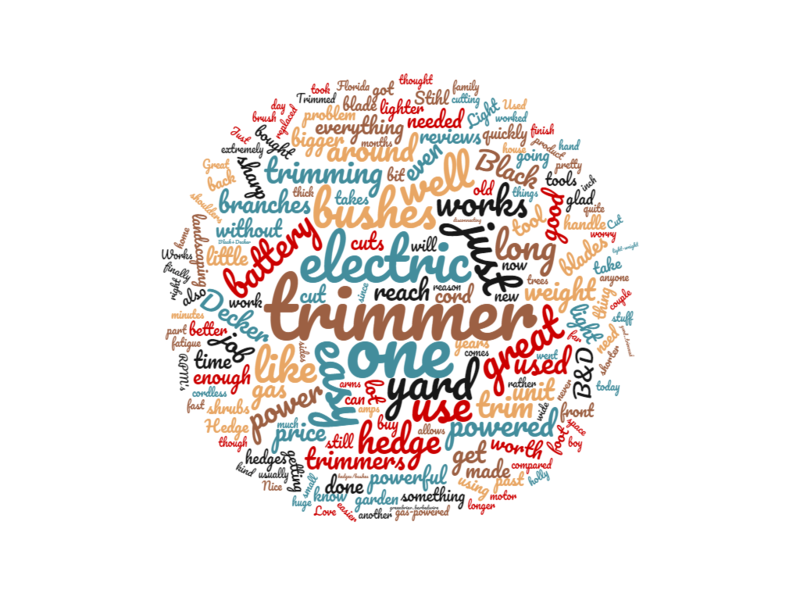 There were no recalls listed for any of the hedge trimmers mentioned here at the time of writing (March 2019). However, it's always a good idea to check the latest information at the Consumer Product Safety Commission website before buying any large, expensive or potentially dangerous product. Switch off & unplug the hedge trimmer before cleaning or maintenance. These guides at doityourself.com and greenindustrypros.com have more in-depth safety information. The Black+Decker HT22 is the best overall choice in our opinion. It is well priced, at least as powerful as its competitors, and above all dependable. The Toro 51490 is a close second, just missing out due to it's higher price. As with all power tools, remember to be safety conscious when operating a hedge trimmer. How do I return my Garcare trimmer that I received this week. It’s a good trimmer but just not the kind of trimmer I can use. Thank you. Sorry you didn’t find the Garcare trimmer suitable for your needs.